More than 150 science students from Philadelphia’s Central High School visited University of the Sciences’ on Monday, October 8, 2018, where they received free CPR training and a demo on how to administer Naloxone, an opioid overdose reversal drug. The Central High School juniors and seniors are studying pharmacology, forensic science, and anatomy and physiology. While at USciences for the day they also had the chance to experience what university-level research is like, hearing from professors and researchers in the pharmacy and pharmaceutical sciences departments about their work while visiting state-of-the-art labs and facilities. 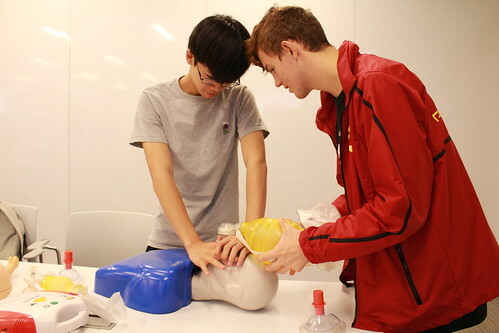 Several students said the day-long visit provided an invaluable chance to get a taste of the college experience and learn about life saving actions. The event was featured by several media outlets including KYW Newsradio and Fox29.